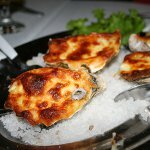 May 16 is National Coquilles St. Jacques Day. If you adore French cuisine and want to make something delicious, begin with scallops. Coquilles St. Jacques (or Saint James scallops) is a rich and simple to make dish, that is perfect for special and festive occasions. You will adore this dish as far as you find a new way of using scallops shells. Coquilles St. Jacques is a mixture or butter, mushrooms, cream, and Parmesan cheese, that is baked in a scallop shell. A wine-flavored cream sauce goes well with tender meat of scallops. Consider baking scallops in shell today to make a perfect dinner. The dish isn't connected to St. Jacques, as you could think, and owes him only the name. The scallop shell is the emblem of St. James the Great (St. Jacques in French). The legend says, that he rescued the knight covered in scallops. As the result Medieval Christians on their pilgrimage to the shrine of Saint James in Santiago de Compostela wore a scallop shell, as a symbol on their clothing.